Liverpool will remain concerned over Mohamed Salah’s injury scare in Egypt’s win over Swaziland on Friday as assistant coach Hany Ramzy offered a mixed update. The 26-year-old was on the scoresheet in the 4-1 win after scoring directly from a corner, but his night ended with concern as he was forced off with an injury. After initially going to ground in the 88th minute, Salah managed to continue briefly before being replaced in stoppage time, with the video below showing how disappointed he looked as he realised that he may have sustained an issue. Although he hasn’t been in top form so far this season for Liverpool with just three goals scored in 11 appearances, the last thing that he needs now is to be sidelined and suffer further frustration over his inability to match the standard he set last season. 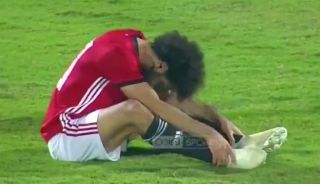 As noted in the tweet below, Egypt assistant coach Hany Ramzy has offered an update after the game on Salah’s condition, and while further tests will naturally be required to offer a fuller picture, he has suggested that Salah hasn’t suffered a tear but there is a strain and it remains to be seen how serious it is. Liverpool may well be pushing for their talisman to return to Melwood this weekend rather than stay with his national team for the rest of next week as they prepare to face Swaziland again on Tuesday. Salah will surely not feature in that game in order to avoid aggravating the problem, and so a return to Merseyside would undoubtedly be the sensible move. Time will tell if that happens, while the wait for those test results will be agonising for most Liverpool fans hoping their Egyptian ace hasn’t suffered a more serious issue.